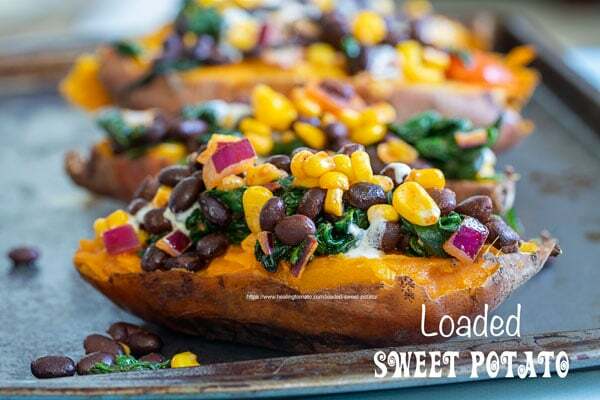 This sweet potato is truly LOADED! 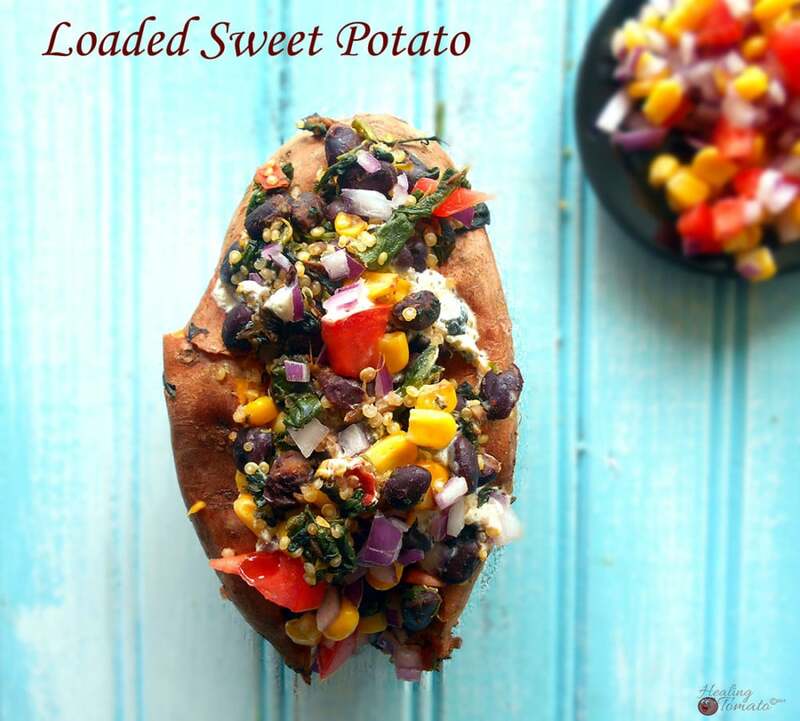 If you are going to eat a loaded sweet potato, I say why not go all out! 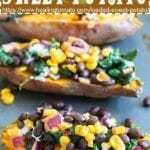 – Serve this sweet potato right out of the oven. Its best when served hot. There is an art to baking a sweet potato. A sweet potato has to be baked evenly and just right. If you don’t have a good baked potato, it ruins the whole taste experience. That’s why I came up with 5 tips on how to bake the perfect sweet potato. Let me know what you think. Black beans are my favorite things to eat with sweet potatoes. To me, both of them are comfort foods. 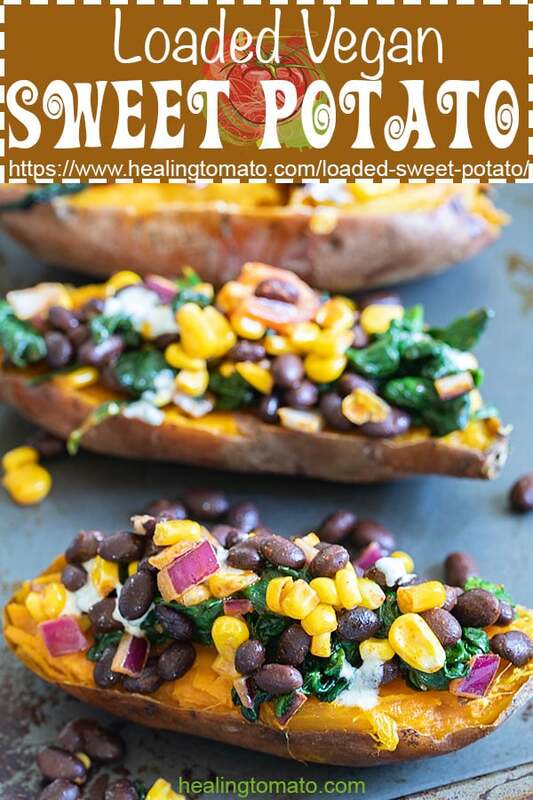 This also works as a black bean salad, if you choose to not use the sweet potato. I used fresh spinach in this and all sweet potato recipes, but, you can also use frozen. Be sure to thaw it and squeeze out all the liquid from it. There is a slight taste of lemony in this loaded potato. I added lemon pepper to it because it just adds a quick tang to it. Ever since I put this lemon pepper in Greek seasoning, I haven’t been able to putting it on everything. Someone should have told me that its an awesome spice. Of course, no loaded potato can be complete without some tomatoes. In my book, all recipes should include some kind of tomato in it. The final topping on this loaded potato was my favorite creamy yogurt dressing. It was a perfect anecdote to the a delicious potato recipe. Vegan cream cheese will give it a very creamy dressing and taste just as delicious. I have also tried it with regular cream cheese and it was soooo good. In the past, I have added hot sauce to the yogurt dressing and it made the sweet potato taste AMAZING! The sweet and spice combination is actually my favorite flavors. Can you freeze a loaded sweet potato? No, it doesn’t freeze well. I wasn’t thrilled by how the frozen sweet potato tasted after thawing it in the oven. It seemed to me that it lost some of its sweet flavoring. Its my experience that sweet potato recipes generally don’t freeze well. They have to be refrigerated and consumed within one week. Yes, you can refrigerate it. I tried this yesterday and the sweet potato retained all its flavors. I baked the sweet potato, loaded it with the black bean mixture and then wrapped it individually. Today, I placed the wrapped and loaded sweet potato into a preheated oven of 425° and let it roast for about 15 minutes. Once it was heated, I unwrapped it and topped it with the yogurt dressing before devouring it. 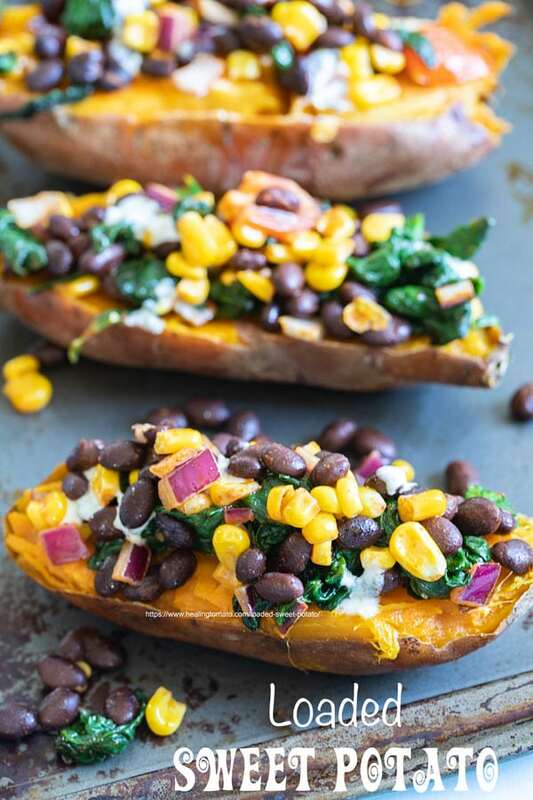 Want more sweet potato recipes? You will love my Tuscan flavored skillet sweet potatoes, vegan mashed sweet potatoes and my all time favorite is the sweet potato hash. Can you serve loaded sweet potato for Thanksgiving? Yes, you can! Vegans love their potatoes and they love it when its loaded up with these delicious ingredients. Its a delicious side dish and its just the easiest recipe to make. I try to suggest easy vegan sides to serve for Thanksgiving, like my Navy Beans Salad. Check out my list of 10 other Thanksgiving recipes to serve vegans. Version 1 was originally published on March 3rd, 2015 (At 3:20 PM, 😂). As I start to learn more photography and better my recipes, I will go back in time to change the previous recipes and refresh them for the present time. In version one, I used quinoa in the recipe. It was really good, but, I didn’t thing it worked well with the yogurt dressing. So, for version 2 of this recipe, I kept the cooked quinoa out and it was the best decision! If you use cream cheese in the dressing, experiment with the quinoa and let me know what you think. When you try this and other sweet potato recipes on my blog, please give me a rating. 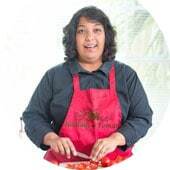 I am always happy to see how you made my recipe. What are some of your favorite sweet potato toppings? Add the corn, black beans, tomatoes, seasonings and salt. - If you can't find plain vegan yogurt, go with vanilla vegan yogurt, regular yogurt, vegan cream cheese or sour cream. What a terrific recipe, I love it. This is great to make on those nights I never know what to cook. This is perfect. 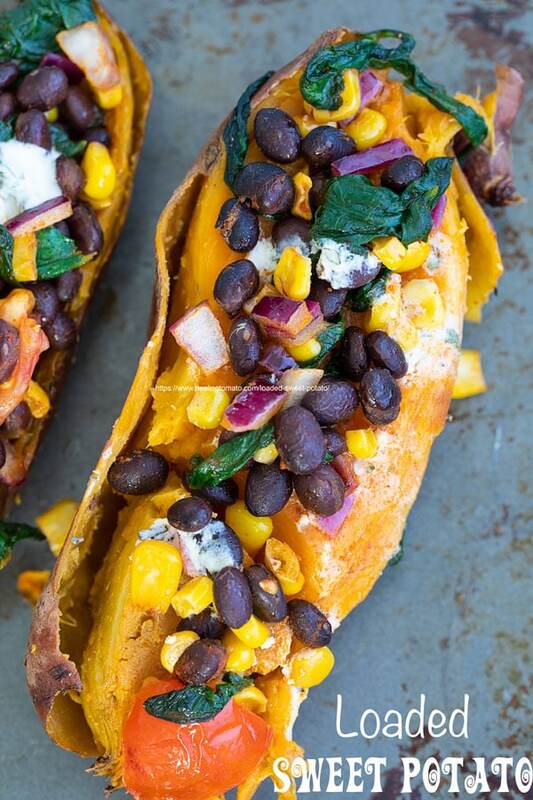 This is a great healthy dinner all wrapped up in a gorgeous sweet potato! Wow this sure is a loaded potato! All these flavors and textures and colors just make this look so awesome! It truly is loaded with flavors and taste! This really is loaded with a lot of goodness. I want to dig right in. This is fully loaded with flavors, indeed! Love that when you eat this, you don’t really need anything more – so yum! This looks glorious, i love all the different colors and textures! 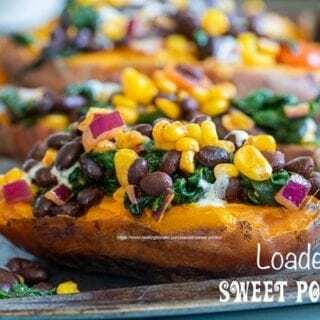 I love sweet potato and your recipe looks delish!